Welcome to your turn-key cyclorama studio in the heart of Manhattan. Perfect for green screen, interviews, products, inserts, and more. 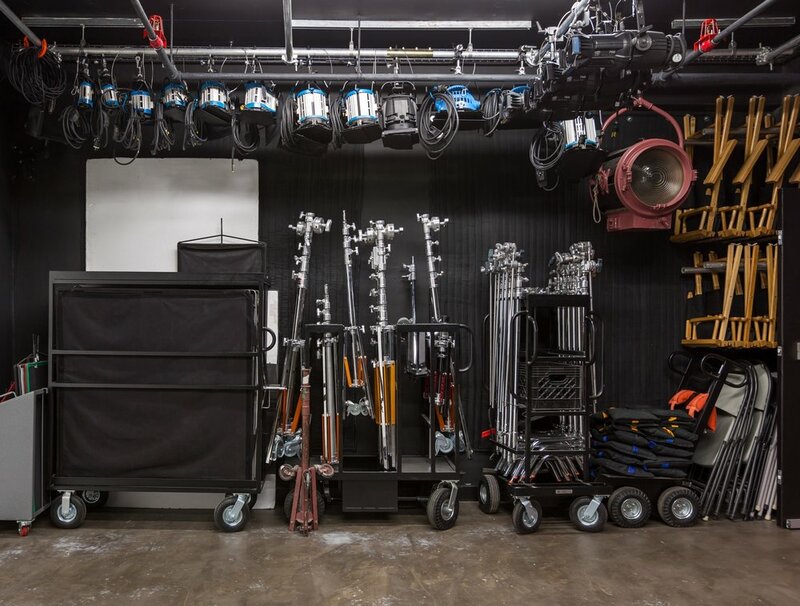 Every rental includes our selection of lights, stands, and other grip & electric equipment needed for a basic shoot. Tables, directors chairs, and other production support is also provided. Total daily rental of over $5,000. 300 amp service ensures you'll be able to power everything. Electrical distribution includes Cam-Lok, 100A Bates, 60A Bates, and 20A Edison. No need to stop the shoot to cool down. Leave these two A/C units on "silent mode" all day long to provide a comfortable climate for your talent and crew. Enjoy your private space while also keeping an eye on the shoot through a 1" thick, 4x8' glass window providing sound isolation. Come and go as you please without disturbing the shoot. Plenty of couch space and remote controlled A/C.